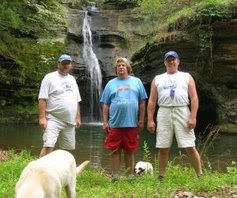 Three Men, Two Dogs, and One Waterfall! Denny's Rightly on the Extreme Left! About three years ago, I 'borrowed' a photo of an Arkansas outhouse from some website or other that I'd never heard of and just kind of stumbled across by Googling for an image to use with a blog entry on the wasps that used to make their nests in the Arkansas outhouses of my youth. At the same time, I linked to Ozark photos at yet another website that I'd never heard of but that sounded closer to home: Exploring Izard County (aka EIC). I hail from Fulton County, just north of Izard, and though we used to make fun of Izard County by painting a large "L" on the county-line sign (just to the left of the word "Izard"), I've always felt a deep connection to that county because my maternal grandmother was born there, in Zion, Arkansas. Well, after I'd posted my blog enty on those damned and damnable wasps -- those hellions from hell -- who should show up on my blog but the blogmeister of EIC himself, Denny Elrod -- but in the guise of "D. Daddio Al-Ozarka." I can decipher that . . . I think. But it ain't necessary. Denny is open enough about his true identity over at his EIC blog. There, you find regularly posted reports on his semi-official explorations of Izard County's natural beauty and cultural heritage. Denny Elrod wasn't supposed to be there, but a couple of fences wasn't going to stop the young adventurer. "At sunrise, we topped the hill," Elrod remembered. "Below us lay Stonehenge (in Britain). Not a building or a car or a soul in sight. My buddy and I found a hole in the chain link fence and crawled under. There was a fence around the stones. I said, 'I'm going for it,' and hopped the fence. Standing under those stones . . . it was unbelievable." [W]hen we went back under the hole in the fence . . . , there was a security guard waiting by my car. Fortunately, he was more amused than alarmed at our indiscretion. When we showed him our military IDs, I'm guessing he thought to himself, "Dumbass Americans!" We ended up chatting with him for a half-hour or so before we set back out to make our way home through Marlborough and Oxford. Elrod's sense of adventure started early in life, when his father was stationed overseas in the Navy. "When I was 6 my dad took me camping on the lava-strewn slopes of Mount Fuji in Japan. When we lived in Crete I spent hours walking through the ancient ruins at Aptera." The family returned to Izard County when Elrod was a teenager. Old enough to drive, he and Dowdle traveled the back roads of the county looking for scenery and places to shoot their guns. Some of their early roadside finds were Clay Cave, the old Lunenburg Schoolhouse and the sand mine at Nasco. Dowdle is his buddy "Rick Dowdle," whom I also met last year and who told me of having seen a really, really big Ozark panther, with entirely black fur! Well, I've never seen one as huge as the one he described (ten feet from nose to tailtip), but as I remarked at the time, I reckon people see what they see. Through his Web site, Elrod received an e-mail from a man describing the natural rock bridge over upper Calico Creek. "Up to then we'd only explored what we could see from the road," Elrod said. "That e-mail started us asking landowners if we could come across their property . . . . Most are proud of what's on their land. Some even give us keys to their gates." He described their trip to the natural bridge as a walk into the distant past, like a visit to Jurassic Park. Web site visitors and local landowners told them about other Izard County hidden wonders like Needles Eye and Moon Eye rock formations on Mill Creek bluff with a 150-foot tunnel down from the top and Hobo's Den cave near the railroad tracks through Calico Rock. "We've found flint arrowheads, old grindstones, hobo symbols in caves and an Indian pictograph," Elrod said. On the Web site they document their adventures with photos and information from local people, e-mails and library research. "One purpose of our Web site is to reach people who have moved away but want to see pictures of home," Elrod said. And that's how I first learned of the EIC, nearly three years ago as I was looking for images of home. I even managed to visit that natural bridge! Anyway, go read Susan Varno's article on Denny and the EIC, and visit the EIC website for more. If you like gently-rugged scenery and down-home country charm, then both article and website will appeal to you. I expect great things from Denny's new career as explorer . . . if he can just keep out of reach of the law! Jeff said, "...we used to make fun of Izard County by painting a large "L" on the county-line sign..."
So THAT'S who was doing that! The article was in print, as well! The response has been great. The best thing about it is that people around town are stopping us and praising the "work" we've been doing. Many of them had never seen the site before reading the article. I'm hoping this will make locals aware of us. Thanks, Jeffery! Your post, as always, was interesting and entertaining. But I must admit....I'm biased. In this case, we can forgive your bias . . . if you can forgive us giving that Izard sing 'ell'. Did my erudite nephew, PhD, actually make a typo? Or was that some kind of chant? It does have a "ring" to it. "In this case, we can forgive your bias . . . if you can forgive us giving that Izard sign 'ell'." Thanks for noticing my typo. I guess that I'll soon be as old and feeble as you. Daddio! Whose side are you on?! Crochety Cran's? Or Generous Jeff's? But 1 is better than 0. Good to know that I'm still ahead in scoring insults. I will retire from the fray with my one and only victory. "The tiger sleeps. Do not disturb the sleeping tiger"
I just made that up, but it sounds good! I never get angry online . . . or, at least, I try not to succumb to it. Austen's Fame: Not Universally Acknowledged? Or am I, not Pullman, the sinister one?